A couple of times, usually in the pub, Catherine has asked me a question. If I had to do one, which, of all the walks I’d done, would I do again? The walk that almost always wins however is the Pennine Way. Why the Pennine Way you may wonder? It’s all moorland, mud, bog and rain. The answer is because of the way I walked the Pennine Way. I did it all wrong. Well “wrong” anyway. I walked it in sections rather than in one go. I walked it during spring and autumn when the weather’s worse. I walked it all out of order, rather than starting at one place and walking to the end. I’d like to do it again so I can rectify those problems, and (hopefully) not spend my entire journey drenched and muddy. Plus I want to go to the Tan Hill Inn again. On the other hand, the way we walked the whole thing gives memories. Who can forget getting stuck on bog a few miles from the end? Who can forget arriving at almost every B&B completely drenched? And who can forget being in the Stag Inn in Dufton where one sodden walker decided to dry their boots in the pub’s old cast iron range, promptly filling the place with steam? And then there was a book at Earby Youth Hostel that we poured over one evening. It was some kind of field report compiled by the Rugby School Natural History Society who walked the route in April 1971. Quite why this work had ended up in a youth hostel in Lancashire, two miles off route, I can’t recall for the life of me. There was no obvious connection. Maybe they’d stayed there or something. 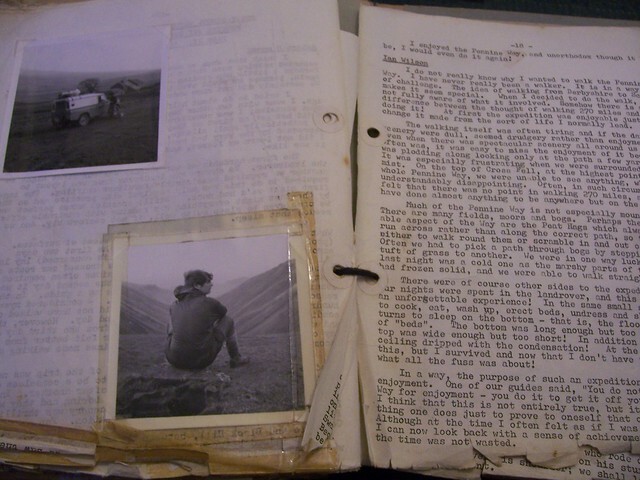 The book was in a bit of a poor state; all worn out sticky tape and slightly torn pages. It was thirty seven years old and clearly hadn’t been kept in secure archive conditions. What it did have though was lots of pictures. Old snaps from film cameras, stuck in. People in dodgy plastic macs standing next to trig points. Some where in black and white, others in that faded colour that always signifies photos from that era. 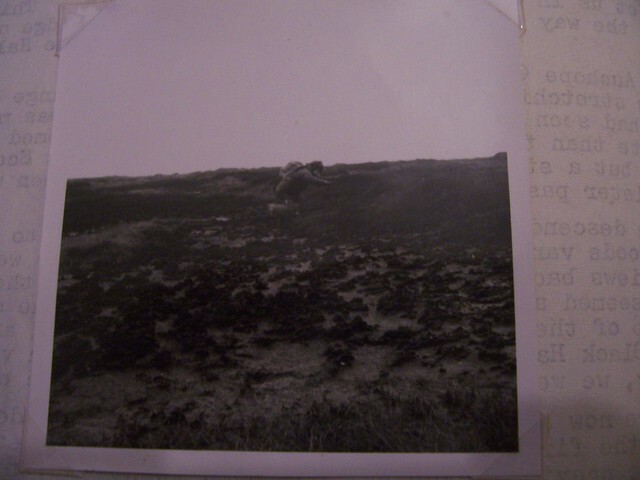 One of the pictures from the book showed someone leaping over some bog, something I did myself several times on that walk. That’s me at the top of this page, seen in the autumn of 2007 trying to get over a particularly problematic stream. Every time I see that photo of me, I picture the pupils of Rugby School and their own photograph of a similar, although probably more impressive endeavour. Which leads to another reason why I’d like to re-do the Pennine Way. I’d like to go walk to Earby Hostel and get a copy of that whole report before it disintegrates for good. Assuming it’s still there anyway. A Sunday Picture will return in January, but look out for our Boxing Day special. True winter walking. In the South East, anyway. First Published: 15 December 2013. Last Updated: 22 September 2015.